Teach your tot to sip from a straw with the OXO Tot Straw Cup. Simply twist the lid to reveal the soft silicone straw. Twist the lid back to conceal the straw, keep it clean and prevent spills. The 7 ounce Straw Cup has non slip grips that make the Cup easy for little hands to hold. The clear Cup and convenient measurement markings show just how much is left. The two part Straw disassembles for cleaning and is easy to reinsert. 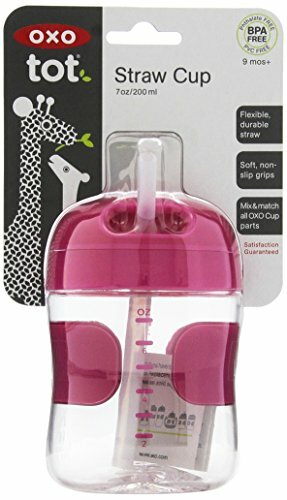 All OXO Tot Sippy, Straw and Training Cup lids are interchangeable.